When this movie was shown at the NW Film Festival last year, there was some mystery around it. The people I asked about it seemed to think there was something… maybe a little… off about it. But they wouldn’t say what! Yeah. For me, there were one or two shockers. I’m not going to say, either. 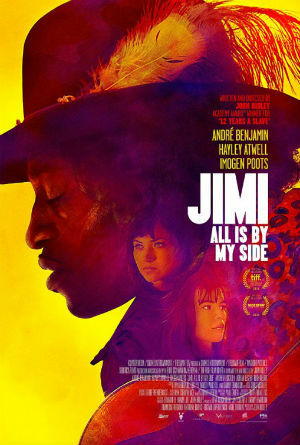 But I’m very troubled by the way this movie – which apparently got a lot of its info verbatim from Charles Cross’s Hendrix bio “Room Full Of Mirrors” – might function as yet another meme about Hendrix. The man is 45 years dead… and still the vultures circle. Incredible, just incredible! See the movie and then do a little research on the internet; if anything strikes you as questionable. For me it’s a cautionary tale about believing everything that you’re told. Andre’ Benjamin’s performance was uncanny, simply brilliant. I liked the sense of getting a window onto the groundbreaking artistic milieu and zeitgeist that was London at that particular time. The film captures some aspects of it very well. I had a big objection to the way that the Devon Wilson character (Ida) was portrayed – as some evil Svengali of romantic intrigue. Phony, sensationalistic and objectionable, in my opinion. There’s more of this kind of portrayal of the women in Hendrix’s orbit. At any rate, after watching this, I did a little research on the internet, listened to some of my favorite Hendrix tunes and had a bit of a cry for the man and his music. Then I picked up Cross’s book, which I’m reading now – with a healthy dose of skepticism. I guess for me it was a vehicle to meditate on the man and his music… 3 1/2 stars out of 5.